Our neighborhood recently welcomed a weekly’s farmers market. I am now officially spoiled to having so many great local vendors nearby. On a recent visit, I was so excited to see fresh strawberries! I immediately remembered a Strawberry Cheesecake Cobbler recipe I’d bookmarked and couldn’t wait to get baking. I’m sure I’m not alone in thinking that berries and cream cheese are a match made in dessert heaven. It’s certainly one of my favorite pairings. 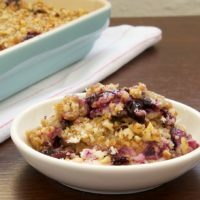 (Have you met this Blueberry Cream Cheese Crisp?) The addition of cream cheese to this cobbler does not disappoint! The mixing method of this cobbler reminds me a lot of those ubiquitous dump cakes. Everything is just put in one pan with very little mixing and then baked. It certainly simplifies the whole process and gets it into the oven much faster. 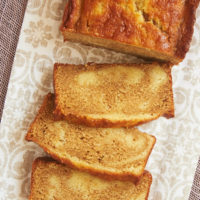 In much the same way, this recipe starts with melted butter, followed by a mixture of flour and milk, plenty of strawberries, and a sweet cream cheese mixture. Once it’s all in the pan, you may have your doubts that it will work. I know I did. But all of that somehow yields this beautiful, delicious cobbler! 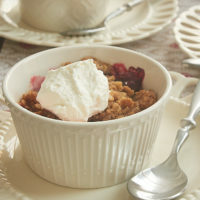 A sprinkling of confectioners’ sugar is plenty of garnish for this cobbler, but a little whipped cream or ice cream wouldn’t be a bad idea either. If you go the confectioners’ sugar route, be sure to add it as you’re serving because it will absorb into the cobbler after a few minutes. 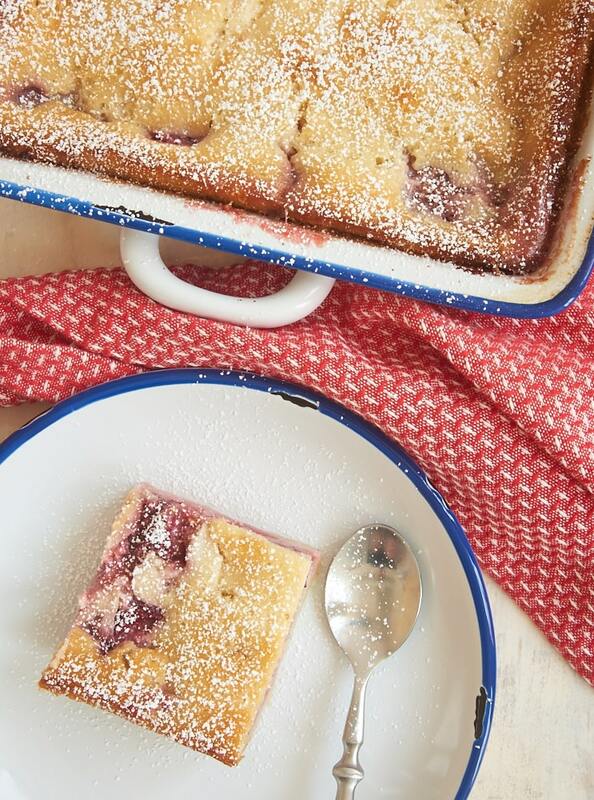 While I do love a more traditional Strawberry Cobbler, this recipe is a tasty twist on the classic. It’s like having cheesecake and cobbler all at the same time. Works for me! 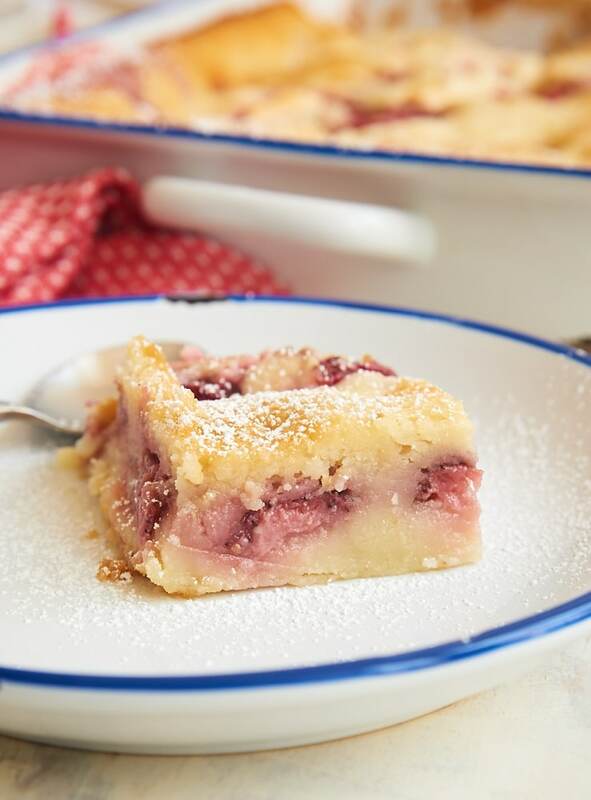 The great flavors of two classic desserts come together in this Strawberry Cheesecake Cobbler! Using an electric mixer on medium speed, beat the cream cheese, sugar, and vanilla until thoroughly combined and smooth. Set aside. Add the milk, and whisk until smooth. Pour the mixture over the butter in the pan, distributing the batter as evenly as possible. Place the strawberries on the top of the batter. Drop the cream cheese mixture by teaspoonfuls over the top. Cover the pan with foil. Bake for 30 minutes. Remove the foil, and bake 20 to 25 minutes, or until a pick inserted into the center comes out clean. Sprinkle with confectioners’ sugar before serving. 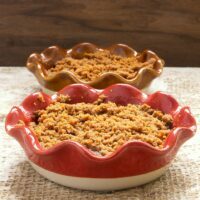 *While this cobbler fits well in a 2 & 1/2 quart baking dish, a 3 quart dish (like a 9″x 13″x 2″ pan) might be a little friendlier to use. It will give you a little extra room and hopefully prevent any of the cobbler from spilling out into your oven. You can also place the baking dish on a lined, rimmed baking sheet to catch any spills. This looks delicious! And easy too, no crust and no eggs. I think I will use a 9 x 13 pan as per your notes. Jennifer, is the lovely white pan with blue rim ceramic or metal? I’m guessing ceramic, as it looks like there’s matching plate beside it, but I’m finding it a little hard to tell. Anyway, which would you recommend for this – glass, ceramic or metal? Thanks! Hi, Marla. I used a ceramic pan, but I think glass or metal would be fine. I made this tonight. It tasted good, very rich, but also very runny. I baked it until the crust on top was fully done and it was cool when I cut it, however, I did use the 2 1/2 qt. casserole and it did not run over. Anyway where the strawberries were, juice was not thick at all. How is it supposed to be. Your comment is helpful Judy, as I am planning to make this for a family dinner this Sunday. Maybe I will use the 2 l/2 qt. dish after all. Strawberries (all berries) get so soggy after washing them, I wonder if there’s some sort of a method for drying them well. Also, I’m wondering if substituting half and half (10% cream) for the milk might help it be not so runny? It should be fairly sturdy and not runny, as you see in my photos. If you didn’t change anything about the recipe, I’m not sure what could have gone wrong. 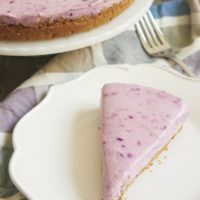 If you used frozen berries, they could have added some water to the batter that altered how it baked. 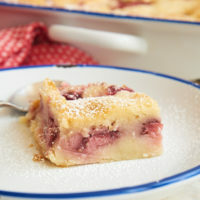 I made the Strawberry Cream Cheese Cobbler this weekend. It was great, my husband loved it. This turned out amazing! I made two for our family dinner Sunday and, despite everyone’s claims of being too full for dessert (dinner was very substantial! ), both disappeared quickly. Absolutely delicious. I served it warm from the oven with whipped cream. Thank you once again, Jennifer, for another perfect recipe, which will be a part of my regular rotation – even when strawberries are not in season! I’m so glad it was a hit, Marla! Hi Jennifer! I made this cobbler today and it was a mess! I don’t know why, the batter was too liquid and in the oven the butter boiled! I don’t know what could go wrong, I followed your directions and I also used cups for measuring the ingredients! I hope you could find out what happened! Hi, Celeste. I’m sorry you had troubles! Somehow, there was too much liquid, so I’m guessing something was off with your measurements. With your mentioning the butter specifically, I wonder if you used a cup of melted butter versus melting a cup of butter. Ohhhh you are soooo great! I used a cup of butter and then I melted it, I should use a cup of melted butter instead, shouldn’t I? I think that should be fine, Carol.